The Christmas season is a great time to visit Annapolis, the state capital of Maryland, and enjoy a variety of seasonal activities. 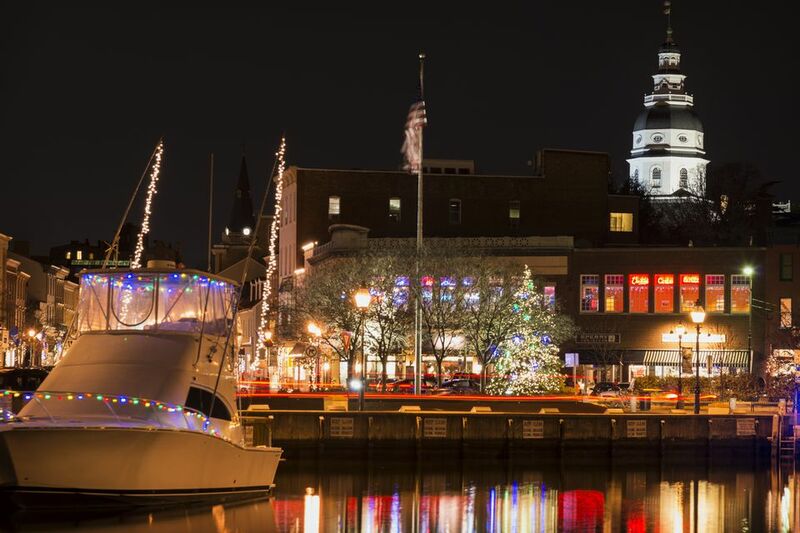 Stroll along the historic seaport, shop for unique gifts, check out some of Annapolis’s museums and 18th-century historic homes, get in the spirit of the season while watching the Annapolis Christmas light boat parade, or listen to a concert of holiday music. Mark your calendar for some of the region's best events. Lights on the Bay is an annual drive-through Christmas light show sponsored by the Anne Arundel SPCA. Drive along the shore of the Chesapeake Bay, and see more than 60 animated and stationary displays illuminating the roadway. $15 per car. In addition to the popular lighting displays that visitors have enjoyed for years, including a colonial village inspired by historic Annapolis and one of the USNA midshipmen tossing their hats in the air, guests will also be treated to two new themes this year: North Pole Village and Enchanted Fairy Tales. This colorful lighting event takes place November 17, 2018 through January 1, 2019, from 5 p.m. to 10 p.m., at Sandy Point State Park, Route 50, Annapolis, Maryland. Celebrate the holiday season with the annual lighting of the tree. Watch Santa arrive by horse and carriage, and enjoy dancing and carols sponsored by the Annapolis Jaycees. The event kicks off November 25, 2018, 5 p.m. - 7 p.m. at the Market House, 25 Market St., Annapolis City Dock. Shop late and enjoy the festivities in downtown Annapolis along Maryland Avenue, Main, and West Streets. Historic Annapolis' shops stay open late for this community block party that is open to all. Enjoy musical performances, food, and refreshments and enjoy some holiday cheer. On December 6 and 13 from 6 p.m. until midnight and December 20, 2018, from 6 p.m. until 11 p.m.
A variety of vendors from Anne Arundel County will be selling homegrown and handcrafted, locally produced items. Items available include wreaths, fresh greens, baked goods, coffee, herbs, candy, and seasonal produce. The holiday market, scheduled for December 2, 2018, is held 8 a.m. to noon at Harry S. Truman Parkway and Riva Road, Annapolis. A dozen local chocolate vendors will be selling chocolate specialties, including chocolate caramels, cakes, chocolate bars, truffles, fudge, cookies, candies, hot chocolate, fondue, martinis, and more. Enjoy live music, a marshmallow roast, a gingerbread house moon bounce, giant snowball run, hot chocolate and a visit with Santa. Tickets can be purchased online. The event is happening December 1, 2018, from noon to 5 p.m. in the First Blocks of West Street, Downtown Annapolis. At the State House (100 State Circle, Annapolis), experience the beauty of Maryland’s historic State House by the glow of the State’s official Christmas tree. The 2018 Maryland State House Holiday display will take place November 30, 2018, through January 3, 2019. The State House Rotunda will be lined with decorated trees and wreaths, provided by Garden Clubs from every jurisdiction in Maryland. The State House will be open daily from 9 a.m. to 5 p.m. except for Christmas Day and New Year's Day. Continuing a long-standing tradition, the USNA Glee Club combines with the Annapolis Symphony Orchestra and soloists from the Metropolitan Opera Company to present selections from Handel's beloved Messiah on Saturday evening and Sunday afternoon. Conducted by the USNA Director of Musical Activities, this beautifully elegant concert has been broadcast on public television stations both regionally and nationwide. You can buy tickets online. This year's concerts take place on December 1 and 2, 2018, at the Main Chapel, US Naval Academy, Annapolis. The parade of lighted yachts takes place every year on the second Saturday in December in the Annapolis harbor. Magic happens as dozens of boats illuminated with thousands of colored lights and crewed by jolly revelers suddenly appear out of the cold winter night. Enjoy a parade of lights when more than 70 power and sailboats show off their holiday decorations. On December 31, 2018, at the U.S. Navy-Marine Corps Memorial Stadium, the Military Bowl presented by Northrop Grumman, benefiting the USO, will match a team from the Atlantic Coast Conference (ACC) against an opponent from the American Athletic Conference (AAC) live on ESPN. Kick-off is at noon, Eastern Time. The Budweiser Clydesdales are expected to be back to lead the way as another exciting bowl season is launched in Annapolis. The parade starts at the City Dock and progresses along the downtown brick streets, cheering on Medal of Honor recipients, team bands and mascots, AAYFA championship teams and many more as they make their way to Navy-Marine Corps Memorial Stadium. After the parade, the Official Military Bowl Tailgate in the parking lot on the west side of the stadium takes place. Admission is free to both the parade and tailgate. Roads along the route will be closed beginning at 8:45 a.m. and will open on a rolling basis as the parade progresses to the stadium. December 31, 2018. Ring in the new year at a family-oriented event. Start the celebration at 3 p.m. on the ball fields behind Maryland Hall and Bates Middle School. Activities will include face painting, an obstacle course, moon bounce and music performed by kids’ rock bands. Be sure to stay for the 5:30 p.m. fireworks. The celebration continues with live music and dancing at Susan Campbell Park and the City Dock at 8 p.m. and leads to a countdown to the New Year and midnight fireworks.